The city will not keep documents submitted to obtain one of the municipal ID cards. NEW YORK CITY — The city will no longer keep any documents filed by applicants for municipal IDs. The mayor's office and the City Council announced Wednesday personal documents submitted to get IDNYCs will not be retained as of January. The announcement comes after the city was sued by two Republican Assembly members to retain data, which Mayor Bill de Blasio vowed to destroy rather than turn over to the federal government in the wake of Donald Trump's election. It was an effort to protect undocumented immigrants. De Blasio also said Wednesday he would consider using a clause in the program to delete the already submitted data before the end of the year. "If you look at the original legislation, which is the law of this city, it was quite clear that we were not going to allow ourselves to be in a situation where those records are turned over to the federal government," de Blasio said earlier this week. "The reason people were willing to trust us is that we made it very clear we would never be in a situation where it would lead to their deportation and we're going to keep that pledge." On Monday, Republican Assembly members Nicole Malliotakis and Ron Castorina sued the city to retain the data saying deleting it would violate the state's Freedom of Information Laws. Malliotakis slammed the new IDNYC policy calling it "unconscionable" and a safety risk in a statement. "I don't know of any other government entity, including the DMV, which the city claims to model its process after, that would do something like this," said Malliotakis. "Plain and simple, this administration is playing politics with the safety and security of the very citizens they are tasked to protect and Assemblyman Castorina and I are going to fight it all the way." Castorina did not immediately respond to a request for comment on the city's new policy. Malliotakis also wrote on Twitter that a judge stopped the deletion of the current data before a hearing can be held in court. They said last week that destroying the information was a security risk because it would make it impossible to trace people who use the card. 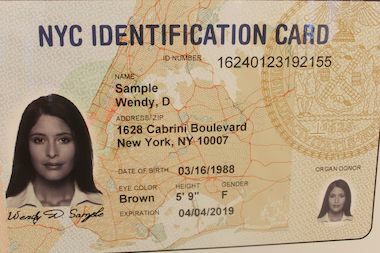 De Blasio launched the IDNYC program in 2015 to issue identification cards to residents like undocumented immigrants, the formerly incarcerated and transgender individuals for who getting regular ID is difficult. It has had more than 900,000 applications since it launched and was made with a "destroy in case of Tea Party" clause to delete data used to get the cards. Trump has promised to deport 11 million undocumented immigrants. Castorina previously said he doesn't believe Trump would follow through with that promise or that data collected during IDNYC applications could be used for deportation.